Can't decide whether what you need is pizza or a burger? You're in luck: restaurateurs Emily and Matthew Hyland, whose popular Williamsburg joint brought Detroit-style pizza and a cult-favorite burger to New York, now have a second Emmy Squared at 83 First Ave. in the East Village. The pies are thick-crusted, square-shaped pan pizzas that come in varieties like the Colony Squared, with Ezzo pepperoni, pickled jalapenos and honey; or the Emmy, with banana peppers and red onion. With a 4.5-star rating out of eight reviews on Yelp so far, Emmy Squared - East Village has been warmly received by patrons. "I never imagined I'd be such a fan of Detroit style pizza but Emmy does it right. 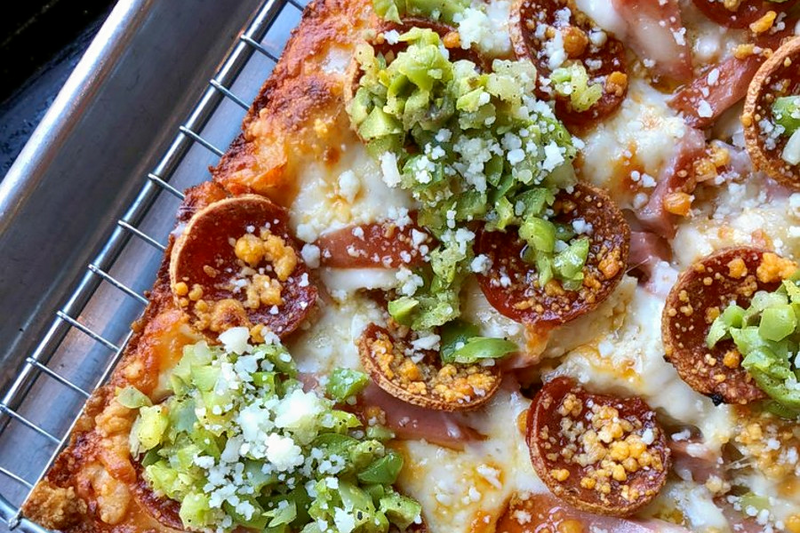 Crust is heavenly and buttery, fresh ingredients, and every pizza is to die for," wrote Courtney B., who was among the first Yelpers to review the new spot on July 27. Yelper Ivy Z. added, "The pizza was very solid. The super crispy pepperoni cups (filled with glorious honey and pepperoni oily goodness) reminded me of Prince Street and the pickled jalapenos added plenty of spicy bite."